This collection is my gift to my indigenous relatives whose lives and history are in danger of being lost to assimilation and erasure. I choose to feature the natural world and the world of the people who gave me life and legacy by including words and phrases in the original Abenaki Language in several of the poems. nothing but water, and over water, air. These two poems seem to bring the reader into sharper focus on what indigenous life has been and has become. 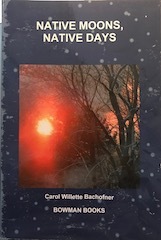 What a gift to read Carol Bachofner's poetry, full of words and phrases from her native Abenaki language that make us long for a kinder world, a world that shows us the possibilities of turning away from the face paints of war — red and black — and opt instead for yellow, the color of peace. Very good poems, indeed. "Our words are a clearing place, a place for fire" … Here too they are the words of her Native relatives and ancestors… Bachofner tends a poetic fire that joins her to such tribal luminaries as Joseph Bruchac, Cheryle Savageau, and Joseph Laurent.